Mumbai: Naveen Jindal, the youngest scion of the O.P. Jindal Group, has emerged the highest paid corporate head in India for the second consecutive year, with a compensation of ₹ 67.21 crore in the last fiscal. 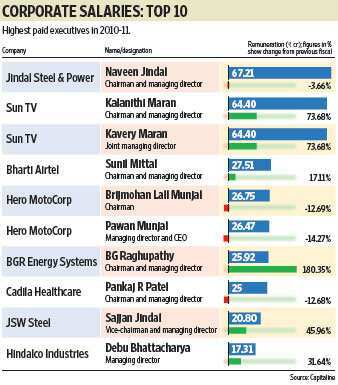 Jindal’s pay was the highest despite him taking a 3.7% cut in his annual package from ₹ 69.76 crore in the previous fiscal, according to a Mint analysis of data from Capitaline, a provider of financial and corporate information. Bharti Airtel Ltd chairman Sunil Mittal was fourth on the list with a take-home of ₹ 27.51 crore last year. His annual salary has grown at a compounded rate of 13% over the past five years, during which he earned a total of ₹ 108.40 crore. Reliance Industries Ltd (RIL) chairman Mukesh Ambani, India’s richest person, doesn’t figure among the top 10 earners. Ambani took home ₹ 15 crore every year for the last three years, but his cumulative salary package over the past five years stands at ₹ 119.48 crore. Anil Ambani, chairman of Reliance Group, earned ₹ 11.04 crore in the last fiscal from four group companies—Reliance Capital Ltd, Reliance Infrastructure Ltd, Reliance Communications Ltd (R-Com) and Reliance Power Ltd. For the second consecutive year, he did not take any commission from R-Com, of which he is non-executive chairman. Hero MotoCorp Ltd chairman and patriarch Brijmohan Lall Munjal was paid ₹ 26.75 crore in compensation last year and ₹ 106.94 crore over the past five years. Managing director Pawan Munjal cost the company ₹ 26.47 crore last year and ₹ 106.66 crore cumulatively over the past five years. Among non-promoters, the highest paid executive was Hindalco Industries Ltd’s managing director Debu Bhattacharya, who took home ₹ 17.31 crore in the last fiscal, compared with ₹ 13.15 crore and ₹ 11.09 crore, respectively, in the previous two years. Bhattacharya, incidentally, earns more than what chairman Kumar Mangalam Birla earns from Hindalco. Birla cost the company ₹ 13.06 crore last year. He was also paid ₹ 9.71 crore by Grasim Industries Ltd and ₹ 1.84 crore by Aditya Birla Nuvo Ltd. A.M. Naik, chairman of India’s largest engineering company Larsen and Toubro Ltd (L&T), took a 7.3% cut in earnings in the last fiscal year, taking home ₹ 14.18 crore, as order inflows in both the firm and the sector slowed over the past couple of years. Unlike a majority of Indian firms that are family-owned, L&T is controlled by institutions. The highest paid executive in the salt-to-software Tata group was the former chief executive and managing director of Tata Motors Ltd, Carl-Peter Forster, who earned ₹ 12.60 crore last year. Tata Consultancy Services Ltd’s managing director and chief executive N. Chandrasekaran earned ₹ 5.30 crore in the same period. Group chairman Ratan Tata earned ₹ 4.33 crore from Tata Steel Ltd and Tata Motors. Interestingly, Crompton Greaves Ltd’s vice-chairman Sudhir Trehan earned more than chairman Gautam Thapar, with ₹ 12 crore against Thapar’s ₹ 8.49 crore. The founders of gold loan company Muthoot Finance Ltd, M.G. George Muthoot, George Jacob Muthoot, George Thomas Muthoot and George Alexander Muthoot all earned ₹ 4.80 crore each last year, up four times from ₹ 1.20 crore in the year before. Among the smaller companies, BGR Energy Systems Ltd chairman and managing director B.G. Raghupathy earned ₹ 25.92 crore last year, higher than the ₹ 23.49 crore earned cumulatively over the previous four years. On a relative basis, Mukesh Ambani was the least expensive founder and chairman measured by remuneration to net profit last year, while Max India Ltd’s executive chairman Analjit Singh was the most expensive, with earnings of ₹ 4.99 crore on a reported loss of ₹ 42.09 crore. Cadila Healthcare Ltd’s deputy managing director Sharvil Patel earned the highest raise in earnings last year, up 713% to ₹ 10 crore from ₹ 1.23 crore in the previous year. Wipro Ltd chairman Azim Premji took the biggest cut in earnings last year, ₹ 1.12 crore, down 86% from ₹ 7.87 crore the year earlier.